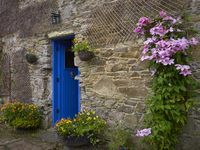 Lovely 18th Century Courtyard Cottage, Authentic Charm abides in Hidden Ireland! Property 43: Lovely 18th Century Courtyard Cottage, Authentic Charm abides in Hidden Ireland! Property 45: Peaceful location,Superb sea views,on the 'Wild Atlantic Way'! ...With internet. Property 48: Luxurious Waterfront Holiday Homes with Private Pebble Beach & Free WiFi. Lovely Bungalow Featuring Panoramic Ocean And Mountain Views. Property 50: Lovely Bungalow Featuring Panoramic Ocean And Mountain Views. My friend and I fell in love the moment we entered the drive at Kevin and Carole&rsquo;s home to see how quaint and well put together and then we fell in love with them and their whole family of animals. From the first day until the last, it was very special. The stay was excellent, but Kevin and Carole made our first trip to Ireland one that we will remember always and relive again and again in our hearts. Hospitable, friendly, kind, giving...the kind of people you wished you knew your entire lives. Thank you Kevin and Carole for making a memory more special than ever imagined. We have a wonderful stay on the farm!